Polycystic ovarian syndrome (PCOS) is a common endocrinopathy typified by oligo-ovulation or anovulation, signs of androgen excess, and multiple small ovarian cysts. These signs and symptoms may vary widely between women as well as within individuals over time. Prevalence estimates of PCOS across the globe are highly variable, ranging from 2.2% to as high as 26%. Community-based studies using Rotterdam criteria among reproductive age group women have demonstrated varied prevalence figures in few Asian countries ranging from 2% to 7.5% in China to 6.3% in Sri Lanka. Most prevalence studies in India are in hospital setups, and recently, a few studies among adolescents in schools report prevalence of PCOS as 9.13%–36%. In PCOS women, ovarian theca cells are more efficient at converting the androgenic precursor to testosterone., The more of androgen production gives rise to hyperandrogenism features commonly seen in PCOS women. Chronic anovulation results in endometrial hyperplasia and heterogeneous cystic endometrium due to unopposed estrogens. The current study conducted in a case–control study design mode was aimed to arrive at clinical, ultrasonographic, and biochemical correlates of PCOS. The present study was conducted in the Department of Biochemistry and Gynaecology of a tertiary care center for a period extending for 1 year. Assuming a two-sided confidence of 99.9%, power of 80%, ratio of cases: controls as 1, and odds ratio of 6, fifty cases and fifty controls needed to be included in the study. However, it was difficult to find age-matched controls willing to undergo clinical, biochemical, and ultrasonographic evaluation for the purpose of this study. Therefore, study participants included fifty clinically diagnosed PCOS patients (diagnosed using according to the Rotterdam criteria) and twenty group-matched healthy female attendants of these patients. To reduce the subjectivity associated with the clinical evaluation of hirsutism, excessive hair growth in women was quantified by the Ferriman-Gallwey scoring system. Following areas were examined during clinical examination: upper lip, chin, chest, upper back, lower back, upper abdomen, lower abdomen, upper arms, thighs. The clinical examination was carried out in the department of gynecology. All controls had self-reported spontaneous regular menstrual cycles and no history of sub/infertility. The controls were further evaluated clinically for features suggestive of hyperandrogenism to rule out possible PCOS. The study was conducted after explaining the purpose of the study to the participants and obtaining written informed consent. Five milliliters of fasting venous sample was used for biochemical analysis. Serum was separated and stored for further analysis. All the hormones were estimated using electrochemiluminescence kits of thyroid-stimulating hormone (TSH), FT3, FT4, Prolactin (Roche Diagnostics; Mannheim, Germany), and estimated on Elecsys 2010 (Roche Healthcare, Basel, Switzerland). Assay reliability was determined by the use of commercially derived control sera of low and high concentrations. The cutoff values for body mass index (BMI) were based on the WHO criteria. The study was approved by the Institution Ethics Committee. Patients and controls meeting any of the following criteria were excluded from the study: A history of ovarian disease or operation, abdominal radiation, or chemotherapy or diagnosed with genetic abnormalities. The data were entered into Microsoft Excel and analyzed using Epi Info software for statistical analysis. In the study group, 60% patients were of 18–25 years, 26% of patients were 26–30 years, and 14% of 31–35 years age. In the control group, 55% were of 18–25 years, 30% patients were of 26–30 years, and 15% of 31–35 years. The maximum number of women was in the age group of 18–25 years both in the study group as well as in control group, i.e. 60% in the study group and 55% in the control group. The mean age in the study group was 24.24 ± 4.42 years and 24.9 ± 4.46 years in the control group. The mean age in study and control group was comparable, and thus the difference between them was not found to be statistically significant (P = 0.578). Hirsutism was present in 40 patients of the study group, i.e., 80% cases, while it was not present in any participant from the control group. Thirty-eight patients presented with oligomenorrhea in the study group, while in control group, all women had normal menstrual cycle [Table 1]. In the study group, 36 patients, i.e., 72% cases were found to be positive for polycystic ovaries on ultrasonography, while in control group, all women had normal ovaries [Table 1]. Further 28 patients (i.e., 56%) presented with both hirsutism and oligomenorrhea in the study group. The mean BMI in the study group was 26.54 ± 5.14 kg/m2 and was higher than the control group at 21.25 ± 1.29 kg/m2. The mean difference between two groups was found to be statistically significant (P < 0.001) [Table 2]. The mean fasting blood sugar (FBS) levels in study group of PCOS patients were 79.92 ± 8.55 mg%, while in control group, it was 77.50 ± 7.78 mg%. The mean difference between study group and control group was found to be statistically significant (P = 0.261). The mean luteinizing hormone (LH) levels in study group and control group were 10.46 ± 3.02 mlU/ml and 5.89 ± 2.12 mlU/ml, respectively. The mean difference between two groups was found to be statistically significant (P < 0.001). The mean follicle-stimulating hormone (FSH) levels in study group and control group were 5.81 ± 2.04 mlU/ml and 5.51 ± 2.48 mlU/ml, respectively. However, statistically, no significant difference was found between them (P = 0.624). The mean prolactin levels in the study group were 13.98 ± 9.92 ng/ml, and in control group, it was 12.26 ± 4.03 ng/ml. The difference between the mean values was not found to significant statistically (P = 0.458). Further, the mean LH-FSH ratio in the study group was 1.97 ± 0.83, and in control group, it was 1.17 ± 0.37. The mean LH-FSH ratio was higher in the study group than in control group and this difference was found to be statistically significant (P < 0.001). The mean TSH in the study group was 2.42 ± 0.99 μIU/ml, and in control group, it was 2.48 ± 0.72 μIU/ml. The difference between them was not found to be significant statistically (P = 0.811). The mean anti-thyroid peroxidase (TPO) antibody value in the study group was 39.27 ± 67.96 IU/ml and 20.84 ± 23.39 IU/ml in control group and was higher as compared to control group but difference between two groups was found not to be statistically significant (P = 0.097). The mean anti-TPO antibody level in the patients having polycystic ovaries was 54.06 ± 75.23 IU/ml, and in women having normal ovaries, it was 1.22 ± 2.37 IU/ml, respectively. The difference between them was found to be statistically significant (P < 0.001). The mean anti-TPO antibody level in the study group had BMI ≥25 was 56.27 ± 83.08 IU/ml and BMI <25 was 13.77 ± 15.31 IU/ml. The difference between mean values of two groups was found to be statistically significant (P = 0.01). The mean LH was 10.46 ± 3.02 mIU/ml and mean FSH was 5.81 ± 2.04 mIU/ml. The correlation coefficient (r) was 0.445 suggesting a positive correlation between these two parameters and statistically significant correlation was observed (P < 0.001). The mean LH was 10.46 ± 3.02 mIU/ml and mean anti-TPO antibody was 39.27 ± 67.96 IU/ml. The correlation coefficient (r) was 0.524 suggesting a positive correlation between these two parameters. The P < 0.001 and thus statistically significant correlation was observed. 5.81 ± 2.04 mIU/ml and mean anti-TPO antibody was 39.27 ± 67.96 IU/ml. The correlation coefficient (r) was 0.341 suggesting positive correlation between these two parameters. The P = 0.015 and thus statistically significant correlation was observed. In the present study, 80% of patients with PCOS presented with hirsutism. The results are similar to studies conducted by Najem et al., Sinha et al., and Esmaeilzadeh et al. wherein 91%, 72.5%, and 80% PCOS patients presented with hirsutism. Further 76% patients of PCOS were presented with complaints of oligomenorrhea in the present study. Again, the percentage is comparable to studies by Najem et al., Sinha et al., and Esmaeilzadeh et al., who observed that 86%, 77.5%, and 92% patients of PCOS presented with complaints of oligomenorrhea, respectively. The mean FBS in study group was 79.92 ± 8.55 mg%, and in the control group, it was 77.50 ± 7.78 mg%, which was well within the normal range, i.e. 60–110 mg% and the mean difference between study group and control group was found to be statistically nonsignificant (P = 0.261). The results are similar to study on PCOS patients by Hassa et al., Hahn et al., Ganie et al., and Karaköse et al., who observed near normal mean value of FBS 86.0 ± 8.8 mg%, 92.6 ± 28.7 mg%, 81.4 ± 13.7 mg%, and 85 ± 10 mg%. Hahn et al. in his study observed the mean BMI in the study group was 31.3 ± 9.8 kg/m2 and in control group was 22.8 ± 3.0 kg/m2. The mean difference was found to be statistically highly significant (P < 0.001). In the present study, the mean BMI in the study group was 26.54 ± 5.14 kg/m2 and was higher than the control group, 21.25 ± 1.29 kg/m2. The mean difference between two groups was found to be statistically highly significant (P < 0.001). Therefore, obesity appears to be an important underlying factor for PCOS. Möhlig et al. in his study observed the mean LH in the study group was 9.01 ± 0.70 mIU/ml and in control group was 6.03 ± 0.61 mIU/ml. Hassa et al. observed that mean LH levels in the study group were 9.8 ± 5.3 mIU/ml and in the control group were 6.6 ± 5.0 mIU/ml. In the present study, the mean LH in the study group was 10.46 ± 3.02 mIU/ml and in control group was 5.89 ± 2.12 mIU/ml. The mean LH was significantly higher in the study group as compared to control group. The increase in serum LH levels is due to abnormal LH secretory dynamics, characterized by an increase in LH pulse frequency and lack of progesterone feedback resulting from anovulation contribute to higher LH pulse frequency. Ropelato et al. in a study observed the mean FSH in the study group was 3.7 ± 0.6 mIU/ml and in control group was 4.2 ± 0.31 mIU/ml. Ganie et al. in his study observed the mean FSH in the study group was 6.2 ± 2.9 mIU/ml and in control group was 7.2 ± 4.3 mIU/ml. However, in our study, the mean FSH in the study group was 5.81 ± 2.04 mIU/ml and in the control group was 5.51 ± 2.48 mIU/ml, which were comparable in two groups. Li et al. observed that mean prolactin level in the study group was 15.91 ± 9.56 ng/ml and in the control group was 18.35 ± 7.83 ng/ml. In the present study, the mean prolactin level in the study group was 13.98 ± 9.92 ng/ml and in the control was 12.26 ± 4.03 ng/ml. The mean value was within the normal range for both the groups and has no significance in diagnosis. However, elevated androgen level can occur with hyperprolactinemia, it has to be ruled out to establish the diagnosis of PCOS. Möhlig et al. observed that mean LH-FSH ratio in the study group was 1.80 ± 0.17 and in the control group was 0.97 ± 0.09. 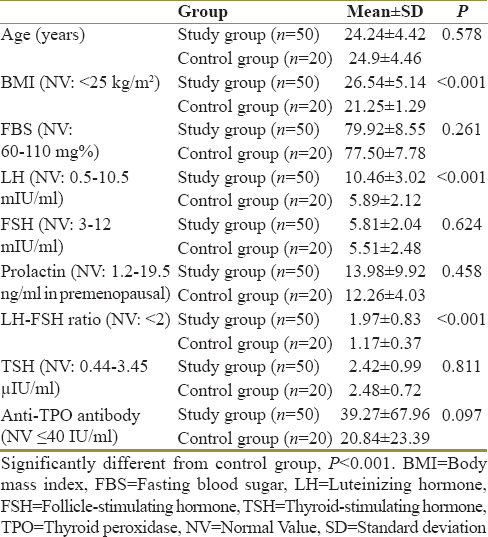 In the present study, mean LH-FSH ratio in the study group was 1.97 ± 0.83 and in the control group was 1.17 ± 0.37. The increase in LH frequency due to increased GnRH pulse frequency typically results in elevated LH and LH-FSH ratio was earlier used as criteria for the diagnosis of PCOS, but the ratio varies with the assay used to measure gonadotropin concentrations. Karaköse et al. observed that mean TSH level in the study group was 1.9 ± 1.1 μIU/ml and in the control group was 1.76 ± 0.9 μIU/ml. In the present study, mean TSH level in the study group was 2.42 ± 0.99 μIU/ml and in the control group was 2.48 ± 0.72 μIU/ml. Women with PCOS usually have normal TSH levels (0.4–3.8 uIU/ml). Janssen et al. observed that mean anti-TPO antibody level in the study group was 123 ± 328 IU/ml and in the control group was 10 ± 18 IU/ml. In the present study, the mean anti-TPO antibody value in the study group was 39.27 ± 67.96 IU/ml and 20.84 ± 23.39 IU/ml in control group and was higher as compared to control group. However, there was an important observation in the present study, when the mean anti-TPO antibody levels in PCOS patients having polycystic ovaries on ultrasonography were compared with rest of the patients in the study group. There was a highly significant difference in the two groups (P < 0.001). Similarly, there was a significant difference in the study group when the mean anti-TPO antibody levels in PCOS patients compared on the basis of increased BMI (P = 0.015). Both these observations suggest the tendency of positivity of anti-TPO antibody levels in PCOS patients. It has been hypothesized in various studies that there exists an association of autoimmunity with PCOS and thyroid dysfunctions. It has been observed that the immunoglobulin produced against the thyroid is polyclonal multiple combination of various antibodies lead to the clinical spectrum of autoimmune thyroid disease that affects reproductive functions also. Interestingly, there is a possible pathophysiological mechanism of ovarian cyst formation in patients with subclinical and overt hypothyroidism similar to those occurring in PCOS. It has also been observed that hypothyroidism produces ovarian cyst and polycystic appearance of ovaries which surprisingly disappeared in all patients after thyroxine treatment. A smaller sample size with a smaller control group could limit the validity of the study. Nonprobability sampling was identified fifty cases as the study duration was limited to a period of 1 year. However, the study per se points toward the usefulness of establishing screening procedures for PCOS, which is being identified more frequently than before. The possible pathophysiological mechanism of ovarian cyst formation in patients with PCOS is immune mediated and possibly similar to subclinical hypothyroidism. Joshi B, Mukherjee S, Patil A, Purandare A, Chauhan S, Vaidya R, et al. A cross-sectional study of polycystic ovarian syndrome among adolescent and young girls in Mumbai, India. Indian J Endocrinol Metab 2014;18:317-24. Norman J, Kumar P, Malhotra N. Polycystic ovary syndrome. In: Jeffcoate's Principles of Gynaecology. Vol. 7. New Delhi, India: Jaypee Brothers Medical Publishers (P) Ltd.; 2014. p. 384-93. Peri N, Levine D. Sonographic evaluation of the endometrium in patients with a history or an appearance of polycystic ovarian syndrome. J Ultrasound Med 2007;26:55-8. Aswini R, Jayapalan S. Modified ferriman-gallwey score in hirsutism and its association with metabolic syndrome. Int J Trichology 2017;9:7-13. BMI Classification – World Health Organisation. Available from: http//www.apps.who.int/bmi/index.jsp?introPage=intro_3.html. [Last accessed on 2018 Mar 10]. Najem F, Elmehdawi R, Swalem A. Clinical and biochemical characteristics of polycystic ovary syndrome in Benghazi-Libya; A retrospective study. Libyan J Med 2008;3:71-4. Esmaeilzadeh S, Andarieh MG, Ghadimi R, Delavar MA. Body MassIndex and Gonadotropin Hormones (LH & FSH) Associate With ClinicalSymptoms Among Women With Polycystic Ovary Syndrome. GlobalJournal of Health Science.2014;7:101-6. Hassa H, Tanir HM, Yildiz Z. Comparison of clinical and laboratory characteristics of cases with polycystic ovarian syndrome based on Rotterdam's criteria and women whose only clinical signs are oligo/anovulation or hirsutism. Arch Gynecol Obstet 2006;274:227-32. Hahn S, Tan S, Sack S, Kimmig R, Quadbeck B, Mann K, et al. Prevalence of the metabolic syndrome in German women with polycystic ovary syndrome. Exp Clin Endocrinol Diabetes 2007;115:130-5. Ganie MA, Marwaha RK, Aggarwal R, Singh S. High prevalence of polycystic ovary syndrome characteristics in girls with euthyroid chronic lymphocytic thyroiditis: A case-control study. Eur J Endocrinol 2010;162:1117-22. Karaköse M, Cakal E, Topaloǧlu O, Arslan MS, Giniş Z, Sahin M, et al. Is there a link between polycystic ovary syndrome and non-thyroidal illness syndrome? J Turk Ger Gynecol Assoc 2013;14:216-20. Möhlig M, Spranger J, Osterhoff M, Ristow M, Pfeiffer AF, Schill T, et al. The polycystic ovary syndrome per se is not associated with increased chronic inflammation. Eur J Endocrinol 2004;150:525-32. Ropelato MG, Garcia-Rudaz MC, Castro-Fernandez C, Ulloa-Aguirre A, Escobar ME, Barontini M, et al. A preponderance of basic luteinizing hormone (LH) isoforms accompanies inappropriate hypersecretion of both basal and pulsatile LH in adolescents with polycystic ovarian syndrome. J Clin Endocrinol Metab 1999;84:4629-36. Li Y, Wei LN, Liang XY. Follicle-stimulating hormone suppressed excessive production of antimullerian hormone caused by abnormally enhanced promoter activity in polycystic ovary syndrome granulosa cells. Fertil Steril 2011;95:2354-8, 2358.e1. Milsom SR, Sowter MC, Carter MA, Knox BS, Gunn AJ. LH levels in women with polycystic ovarian syndrome: Have modern assays made them irrelevant? BJOG 2003;110:760-4. Berek JS. Endocrine disorders. In: Novak's Gynecology. 13th ed. Philadelphia: Lippincott Williams & Wilkins; 2002. p. 871-930. Du D, Li X. The relationship between thyroiditis and polycystic ovary syndrome: A meta-analysis. Int J Clin Exp Med 2013;6:880-9.